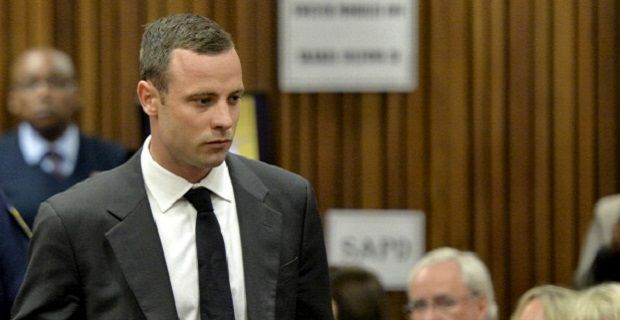 The first day of the highly-anticipated Oscar Pistorius trial threw up very few surprises but as experts believe the case could be heard for up to six weeks, it’s very early days. The Reeva Steenkamp murder on Valentine’s Day 2013 shocked the world so the media attention is unprecedented. South African TV will show the trial live and the accused faces a media scrum of cameramen and reporters as he entered the court. The main witness on the opening day was Mrs Burger, a neighbour of Pistorius whose testimony many experts believe will “nail” the former Olympian who pleaded not-guilty. Mrs Burger, a university lecturer who lived on the neighbouring estate to the Silverwoods Estate where Pistorius stayed, initially gave her evidence in Afrikaans so a translator but then switched to English under intense questioning from defence lawyer Barry Roux. She described hearing the victim’s “blood curdling” screams and was adamant that she heard gunshots rather than the sound of a cricket bat being used to break a door down as Mr Roux kept suggesting. Mrs Burger said: “Just after three [am] I work up from a woman’s terrible scream. Just after her scream I heard four shots. It was four gun shots that I heard. The time between the first and the fourth shot was much longer than between the second and the third one.” She went onto clarify the timing of the shots by saying “bang” at the timing of each shot. This demonstrated to the jury that there had been an initial shot, then two middle shots close together followed by a pause before the final shot. Mr Roux tried to get the witness to say that the shots, in particular the last one she heard, could have been the sound of a cricket bat breaking through a door which is in keeping with his client’s version of events and that the women’s screams were those of Pistorius in a panic, but the witness kept rejecting these theories. The trial has been adjourned until 9.30am local time (7.30am GMT).